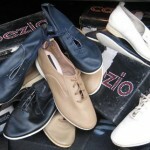 We loved candy bright pastels, fluorescent eye-poppers, and gritty-tough black clothes in the eighties. Soft, subdued, natural shades: not so much. Perhaps it’s easiest to say we liked colors that didn’t appear in nature all that often. It follows, then, that metallic clothes and accessories were a futuristic trend that we snatched right up in our lace-gloved little hands. Shiny! Eye catching! Judy Jetson-esque! We loved gold and silver items in particular, with occasional dashes of bronze, copper, and vibrant metallic colors thrown in. 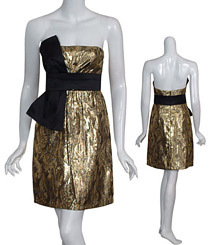 This vintage 80s dress (see pic #1), objectively, is just lovely. 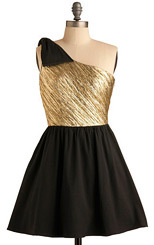 The black velvet bodice with sweetheart neckline is totally flattering, and those gold ruffles make me want to dance to some Culture Club, STAT. 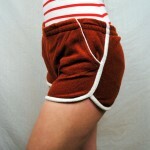 The rhinestone embellished bows on the back are, of course, full-on 80s. But look! 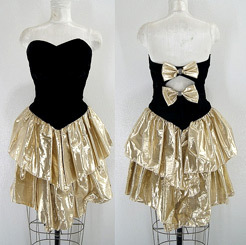 We love us some black velvet and gold lame’ (see pic 2) nowadays too. Pretty, no? Again, a super flattering cut that is both bold (shiny!) and flattering. That nipped-in black waist is slimming, and that sideways bow is both edgy and feminine. And there’s plenty of 80s tribute dresswear out there, too. This little sparkler (see pic 3) is adorable, too. 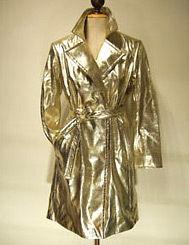 Check out this vintage gold trench coat (see pic 4). Gorgeous, right? Wow. Those wide lapels. Those epaulets. That fabric with the perfect amount of body; it holds its shape, but drapes beautifully and cinches in to a nice lean waist. Swoon. But wait! 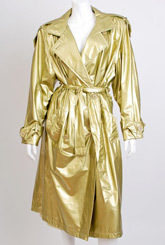 They’re still making gorgeous gold trench coats (see pic 5)! Metallic coats are currently just all over the place. 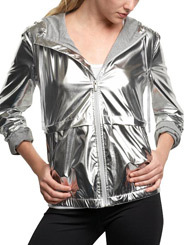 For example, The Gap has a super cute hooded rain jacket (see pic 6). 4. Trench coat from Twin Hearts Vintage. And look! 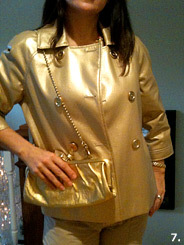 I have my own metallic gold pleather swing coat (see pic 7)! Sweet, huh? Picked this baby up at a discount department store last year for, like, thirty bucks. I get loads of compliments every time I wear it. And my husband gave me the little gold party purse to go with. Of course, the metallics weren’t (and aren’t) just for dress-up. Here’s a vintage pic (see pic 8) of a head-to-toe shine that’s just right for daytime. Or the school Harvest Dance. Take your pick. 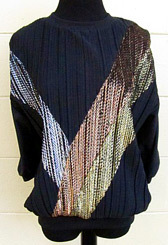 This vintage top (see pic 9) is both totally 80’s and completely current. How cute would this be over black leggings with a pair of wicked boots? 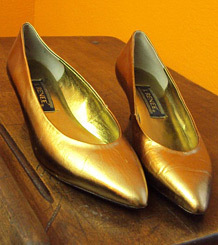 OR with a pair of adorable gold kitten heels (see pic 10). 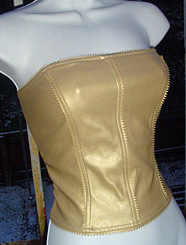 Check out this vintage gold bustier (see pic 11). FIERCE! Imagine that paired with a chunky faceted necklace or a lariat chain and worn with your black leather jeans. Perhaps a studded black belt? Ruffled lace gloves are entirely optional. I am totally dazzled after shopping for all this fabulous metallic stuff. Luxe, modern, edgy, and classic: perfectly gorgeous.